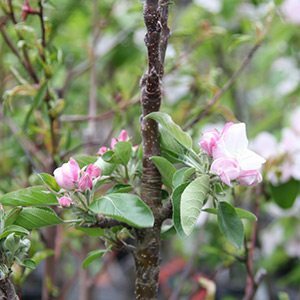 Especially bred and trained in the nursery before sale, Columnar Apple trees are ideal for smaller gardens and even in a container in a sunny courtyard. They produce normal size fruit on a tree that grows to less than 1 m in width. Most will reach around 3 metres in height.Fruiting spurs are short and kept near the main trunk. They do require good sun, and like most apple trees require a cool winter to fruit well. Fruiting time is usually in late summer to autumn, depending on the variety. Most varieties will require a pollinator to fruit well, so look for a pair that are suited as cross pollinators for best results. If you are planting a Columnar Apple Tree in a container you will a good quality potting mix and a container that have good drainage holes. In the ground, prepare the soil well without digging down into have clay. If needed add some well rotted compost. You will need to water regularly through the first few summers. Check the moisture level in the potting soil in container grown trees and do not aver water. fertilise with a specialist fruit tree fertiliser each spring. Pruning involves cutting back the side shoots to around 10 – 15 cmd from the main stem. This is best carried out in winter.